10 Schiffe im 12x12 Feld. Start mit Menue "schiffe" -> "Neu" und Auswahl der Anzahl der vorgegebenen Startpositionen der Schiffe. Alle Schiffe liegen senkrecht oder waagerecht im Feld. Kein Schiff berührt ein anderes, auch nicht diagonal. Die Zahlen links und oberhalb des Feldes geben die Anzahl der Schiffselemente in der Zeile bzw. Spalte an. Nachdem in der Liste rechts vom Feld alle zu suchenden (und gefundenen) Schiffe markiert wurden, gibt ein Klick auf den großen Schiffs-Button das Rätsel-Ergebnis aus. 10 ships in 12x12 array. 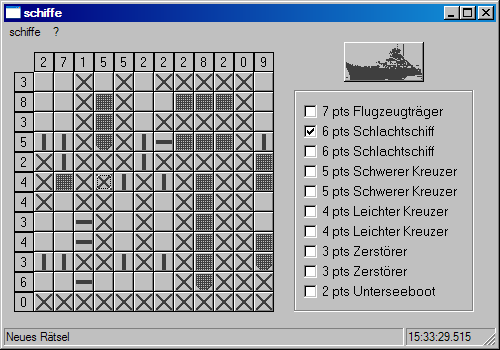 Start with menue "schiffe" -> "Neu" and choose number of starting positions of ships. All ships are set horizontal or vertical in the array. No ship touches another ship, also not diagonal. Numbers at the left side and above the array counting the ship elements in the row or column. After all seeked (and found) ships are marked in the list right to the game field, one click at the big ship button outputs the puzzle result. Not every random created puzzle is solvable - annoying - sometimes there are two or more solutions possible - just start a new one (it is addictive). Very rare, an error message occures while starting a puzzle (because of an internal software error in the backtracking algorithm - doesn't work properly) - don't worry, just start a new one (yes, it is addictive).